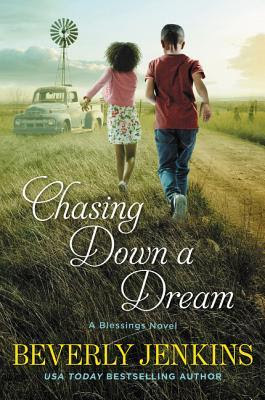 NAACP nominee and USA Today bestselling author Beverly Jenkins continues her beloved Blessings series with a heartwarming novel about what really makes a family. There's never a dull day in Henry Adams, Kansas. Tamar July has always had a hate-hate relationship with her cousin Eula, which is why she's shocked when Eula arrives with the news that she's dying and wants Tamar to plan her funeral. Still, family is family, so Tamar is willing to drop everything for her. Meanwhile, after a horrendous storm, Gemma finds a young boy and his little sister walking on the side of the road. She takes them in and quickly falls in love with the orphaned siblings. But when Gemma contacts Social Services to try to become their foster mother, she's told she's not an appropriate candidate, leading to dangerous consequences. And in the midst of these trials, Jack and Rocky are trying to plan their wedding. The entire town comes together to lend a helping hand, and once again, Henry Adams's irrepressible residents show that despite seemingly insurmountable obstacles, families come in many forms. Welcome back to Henry Adams, Kansas the coolest "fictional" small town in America (in my opinion), for the eighth installment in The Blessings series by the incomparable Beverly Jenkins, with Chasing Down a Dream. For those of you unfamiliar with Henry Adams, this town was founded by freed slaves in the late 1800s. This once prosperous town was down to a handful of residents before the current mayor, Trent July (grandson to the town's matriarch Tamar July) put the town for sale on eBay (yes, eBay). That's when the wealthy divorced Bernadine Brown stepped in and bought the town lock-stock-and-barrel. Over the past few years, she's helped to rebuild the town's infrastructure, paved roads, built a school, community recreational center, church, homes, and more. This once dying town is now a thriving small town where everyone comes together to help out the town and each other. Tamar July is the town matriarch and a speed demon (as evidenced by the speeding tickets she's been accumulating lately). At 90+ years of age, she's also wondering if her end is near as she's recently begun having some strange dreams. The dreams begin to make sense when her cousin Eula Nance shows up, reveals she's dying, wants to be around family near her end and wants Tamar to plan her funeral. Tamar, being Tamar, does the only thing she can do and takes her in, calls in the family. Gemma Dahl is making a new life for herself and her grandson in Henry Adams. She has a good job, a nice home, and is even going back to school to take a few business classes to give herself more opportunities for advancement. What she doesn't expect to do is come upon two orphaned children and become a foster mother, but that's exactly what she plans on doing until one social worker breaks up her newly enlarged family. Meanwhile, the town's one restaurant, a diner actually, isn't large enough and tentative plans are underway to build a slightly more upscale restaurant. Needless to say, the current restaurant's owner isn't really happy with that idea even though there's more than enough business to go around. In just a few short years, Henry Adams has a world-renowned recording studio, a newly refurbished diner, a recreational center, a church, a school, a newly refurbished and historic hotel featuring one bedroom apartments upstairs and mixed-use space downstairs (a hair salon, medical clinic, and a coffee shop), a community swimming pool, a volunteer fire department, and more. Although this town is growing by leaps and bounds, there's still plenty of drama, some from ancient feuds, some from newly minted feuds, internal and external family feuds, and more. Disclaimer: I received a free print copy of this book from the publisher for review purposes via LibraryThing's Early Reviewer Program. I was not paid, required, or otherwise obligated to write a positive review. The opinions I have expressed are my own. I am disclosing this in accordance with the Federal Trade Commission's 16 CFR, Part 255: "Guides Concerning the Use of Endorsements and Testimonials in Advertising."